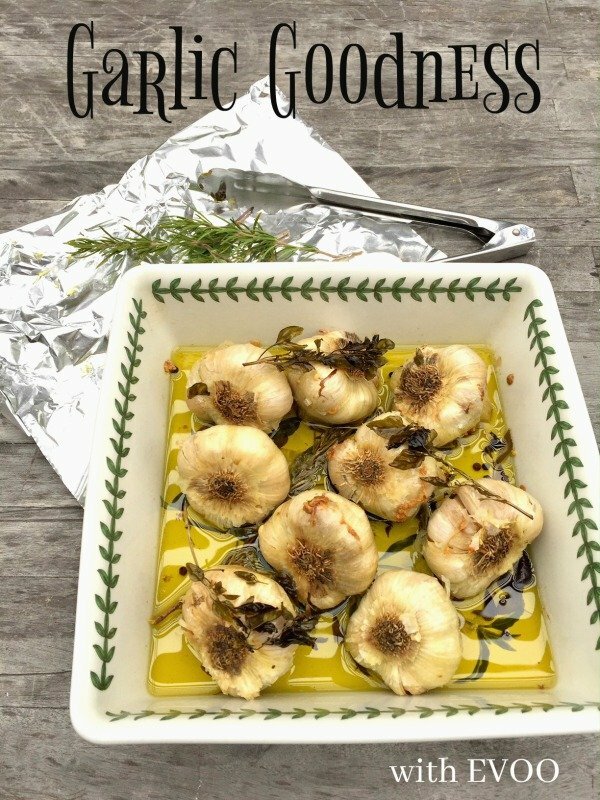 Have you ever wanted your house to smell so good the neighbors would be asking, “What’s Cooking Mary?” Well, with the cooking of any onion, especially garlic this can be a very inviting experience. My house smelled for days…that’s a good thing in a Greek home. The only drawback is everyone must have some of your dish! Most people put out an intoxicating candle, or spray a mist of canned aroma, but being Greek it’s all about the garlic, roasting in a stew, with a Sunday Leg of Lamb, or herb scented potatoes baking away, it’s all good. I bet if they had a garlic perfume on the market, it would sell out because I would buy it by the case. And don’t forget garlic has many health benefits, let alone it’s culinary uses. Manganese, Vitamin B, Vitamin C, Selenium and Fiber. So, I set out to bake a batch of garlic bulbs, with what we call the poaching method with extra virgin olive oil. Poaching is defined as low and slow. There’s no need to fully cover the bulbs with extra virgin olive oil, just add enough to fill the pan half-way up the sides. Half-way through poaching just turn the bulbs. 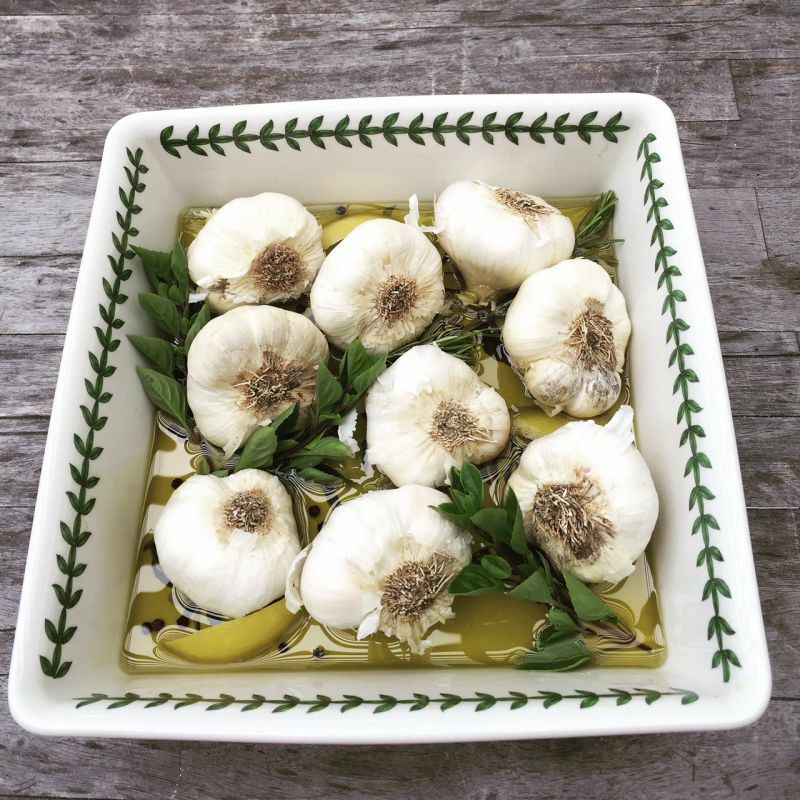 There's nothing like the smell of garlic poaching in extra virgin olive oil. Use it on toast, in stews and soups and in your dips and spreads. In an oven-proof pan place the garlic bulbs root side up. Add the peppercorns, herbs of your choice, lemon peel and olive oil. If you choose to use the olive oil afterwards, I would cover the bulbs completely with olive oil. To use less olive oil fill half way up the pan. It is not necessary to cover the bulbs, turn them half way during the cooking time. Place in oven uncovered and poach for 15-20 minutes. According to your oven's temperature, adjust the temperature if oil is bubbling. Lower to a simmer. Don't leave unattended. Test a bulb, by inserting a knife in the center to check for doneness. The clove should be soft. Carefully, remove pan from oven and let completely. Remove the bulbs with a large spoon or tongs and strain the oil into a sterilized jar and save for dressings, topping pizza, toasted appetizers or simply for dipping. Squeeze each bulb, releasing the toasted cloves and place in a covered container in the refrigerator. Enjoy on your salads, roasted vegetables, pastas, pizzas and bread. If you are into garlic like I am and in California don’t miss the Gilroy Garlic Festival in July every year. Everything imaginable is made there with this incredible bulb. There’s an old saying ~ If you are to eat garlic, then everyone in the household must too!